The final thing we will need to start a flint and steel fire is tinder. The tinder is the stuff that will eventually burst into flame. There are many things that can be used for tinder. 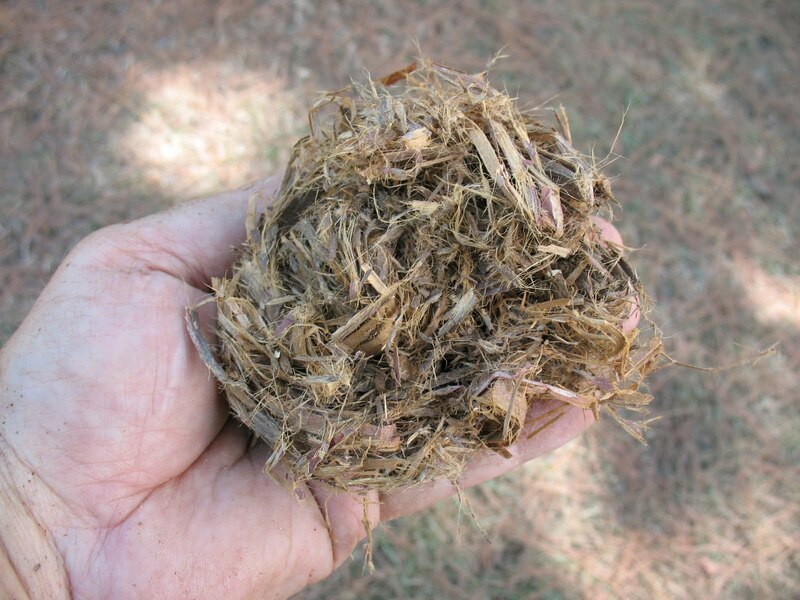 Probably the most commonly used items are shredded cedar bark, dry grasses, leaves, tow fibers, and jute fibers. The bark and grasses are gathered in the wild. Tow is a coarse fiber that comes from the flax plant, and jute is another fiber that is most commonly used to make twine or rope. Obviously tow and jute are not gathered in the wild. Whatever you use for tinder it must be very finely shredded, and it must be bone dry. Cedar bark is harvested from a cedar tree. In my area we actually have juniper trees, but we commonly miss-call them cedars, and the bark works fine as tinder. 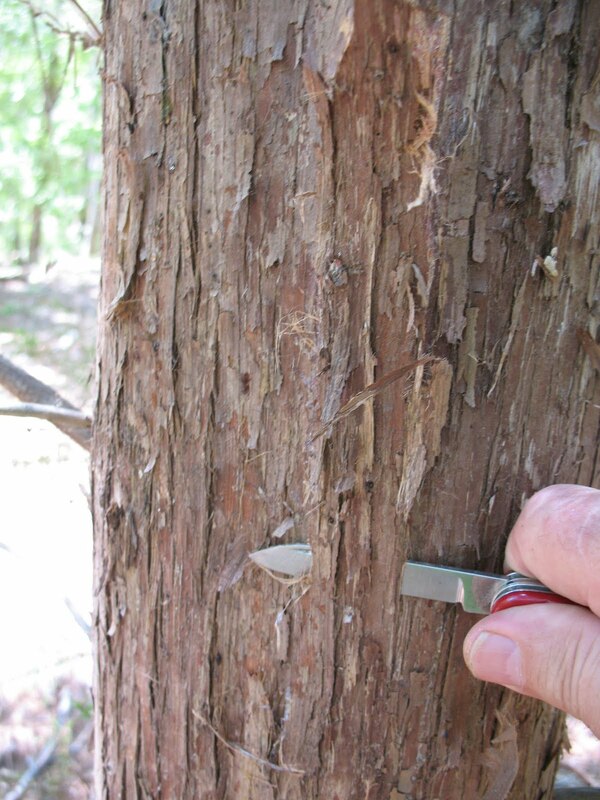 All you have to do is locate a cedar tree, living or dead, and use your knife to peel off a few strips of the bark. Don’t cut down into the white. You just want the dark brown outer bark and the light brown inner bark. These will be dry, whereas the white layer beneath them is very moist. Don’t worry about harming the tree. As long as you don’t peel bark all the way around the tree, the tree will be fine. 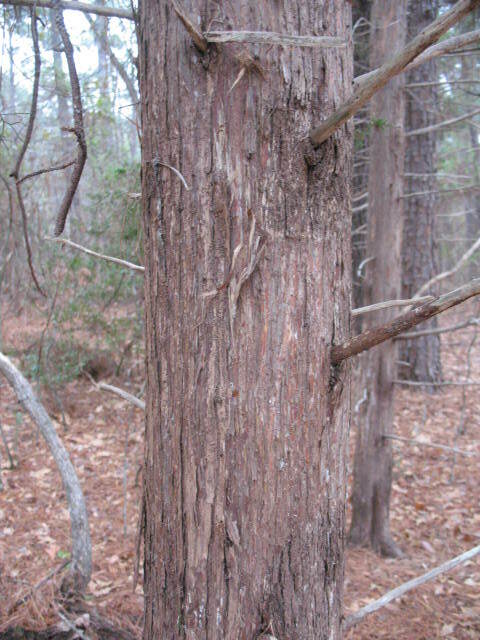 Pictured below: top, cedar bark on tree; middle, removing bark from tree; bottom, strips of cedar bark. When you have collect a few strips of cedar bark, wad them up into a ball and crush them with your fingers, then un-wad it and twist it gently. As the bark becomes more workable you can start rubbing your hands back and forth, turning and compressing the bark. Before long the bark will start to separate into fibers. Work the bark for a good while. The finer your fibers; the easier it will be to set them on fire. Pictured below is a finished tinder bundle made of cedar bark. Dried grass will make good tinder if it is bone dry. 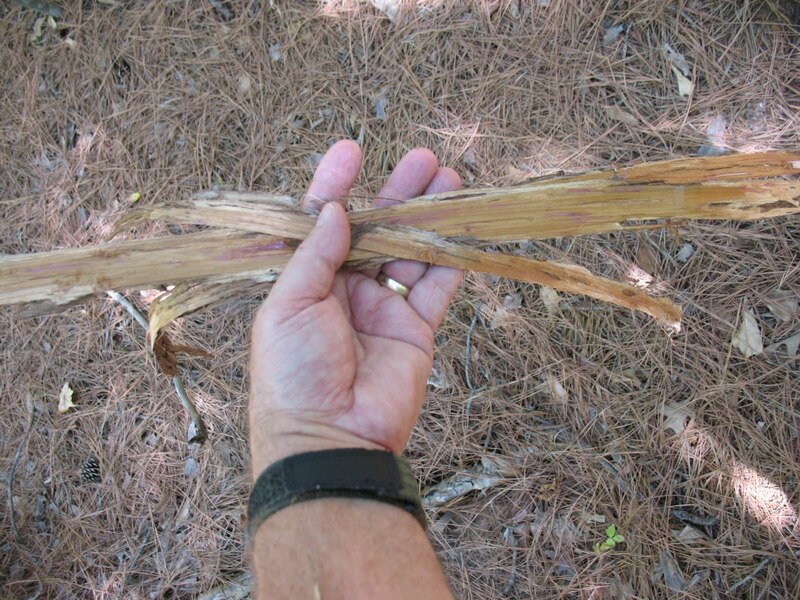 You need to look for a grass that has blades rather than stems. I usually don’t try to use grass here in East Texas because our climate is very humid and we get a good amount of rain, usually. Right now it hasn’t rained for over a month and it’s been over 100 degrees Fahrenheit nearly every day of that month. So right now I think grass would work. If you live in an arid climate like West Texas or elsewhere in the southwestern United States, chances are you can find some grass that will work for tinder. I saw a guy in southeastern Colorado walk out and pick a bunch of prairie grass and use it to start a fire with a fire-bow-drill, and that’s harder than starting a flint and steel fire. If you use grass you will need to work it a little bit to break it up, but not near as much as you would work cedar bark. 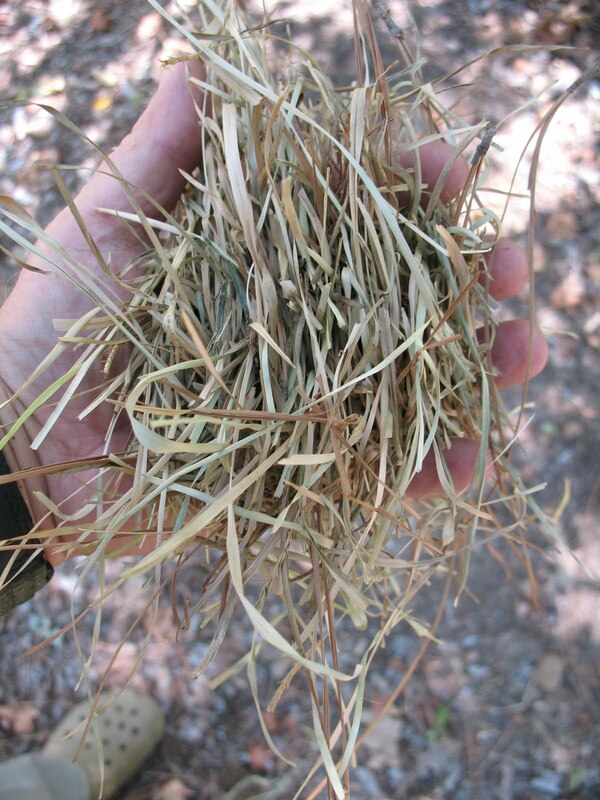 Pictured below is some dried grass that has been worked into a tinder bundle. 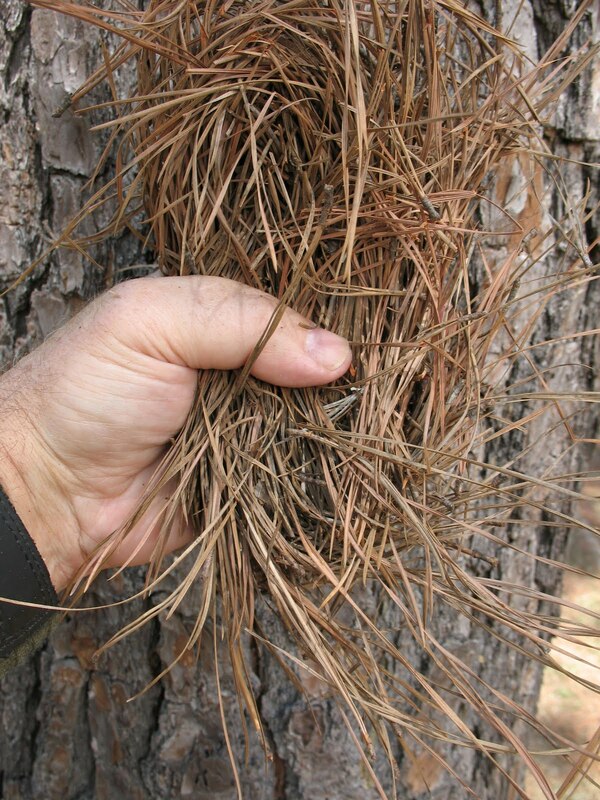 Pine needles and leaf litter can both be used for tinder, but they must be 100% dead and bone dry. 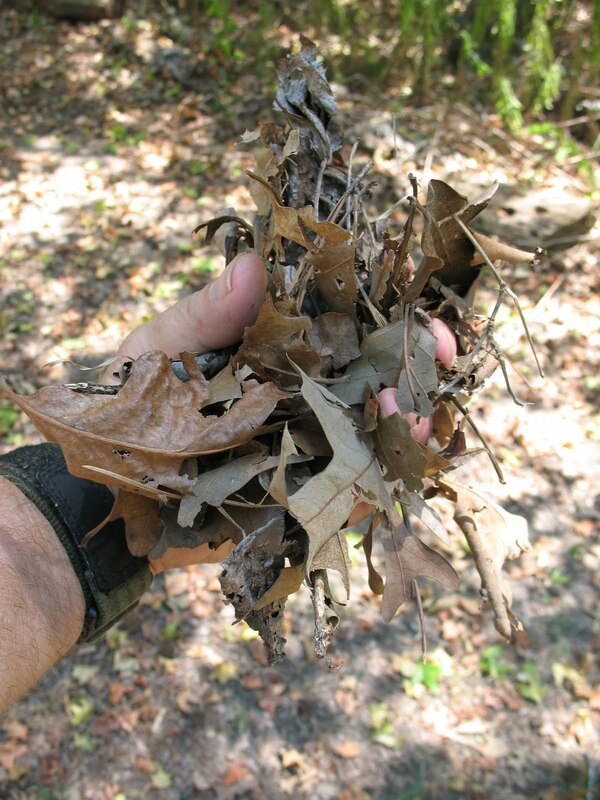 Pictured below: top, pine needle tinder bundle; bottom, leaf litter tinder bundle. I don’t know of any local source for tow fibers. 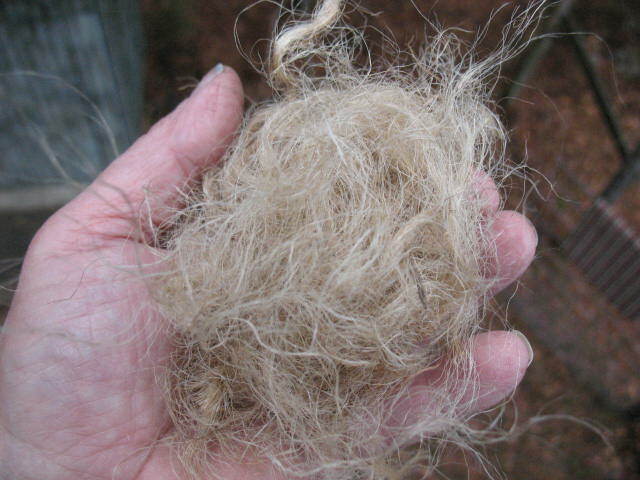 Tow is a rough fiber that is a by-product of making linen. Back in the day tow was used to weave rough bags. In the South we call these tow sacks. Today I only know of two sources of tow and they are to buy it at a mountain man rendezvous or order it on-line from some place like Dixie Gun Works. Jute fibers on the other hand are widely available. Nearly any hardware store sells jute twine, and the larger jute rope can usually be found a craft stores in the macramé section. All you have to do is cut the rope or twine into four or five inch sections then pull it apart into individual fibers. 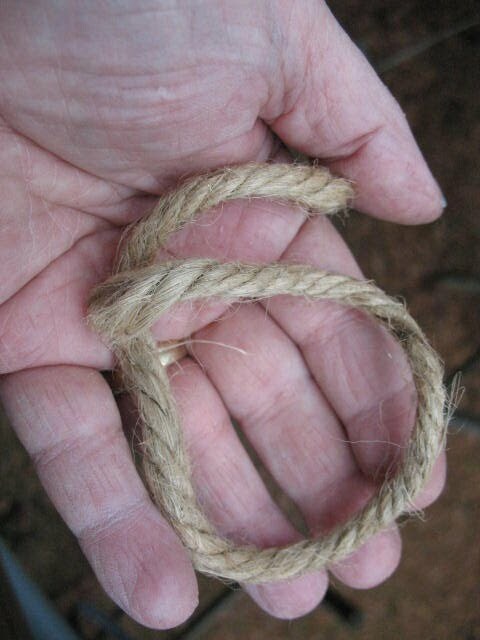 I carry about ten inches of jute rope in my fire making kit so I know that I will always have dry tinder with me. All I have to do is cut off a section and pull it apart into fibers. Pictured below on top is a piece of jute rope, and on the bottom is a jute tinder bundle. Now we have our final ingredient, so in the next post we will make a fire.